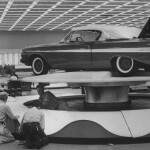 This photo was taken by Robert W. Kelley at Cobo Hall in Detroit during set-up for the 43rd Annual National Automobile Show. The image was sourced from the LIFE magazine collection, and is noted to have been taken in October of 1961, but this is incorrect. 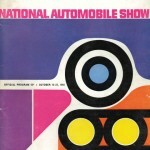 In fact, it would have been taken in 1960 since the purpose of the event was to showcase the new cars for the coming year, 1961. The car is a 1961 Chevrolet Impala Convertible. It has been perched up on a turntable, with workers still getting things set-up. The car still has the protective cover over the convertible top that comes on these cars when they arrive at the dealership. The car also hasn’t had the wheel covers or hub caps installed yet. Even the chrome on the bumpers still has a protective cover on them. No doubt, this car had to remain perfect for this important show. Also shown is a scan of the cover to the shows Official Program.